But that is not the statute that Shurat HaDin is going to use. The use of Human Shields, like IHL in general, is contested. Even putting aside that both journalists and the man on the street like to consider themselves experts to the extent that they state opinions as fact, even those who are actually expert in IHL do not agree always agree. In other words, based on the wording of the Geneva Convention, when IHL forbids the use of Human Shields, it is talking about using citizens of the enemy country - not one's own citizens. Going a step further, based on the above, since Hamas is not a party to the Geneva Conventions, could it be that Gazans are not protected by the Geneva Convention from being used as Human Shields even if it applies to nationals? Parties to an armed conflict, be the armed conflict an international armed conflict or a non-international armed conflict, cannot lawfully use human shields. While Hamas is not a High Contracting Party to the Geneva Conventions, meaning that it's not bound by the terms of the General Conventions, it's nonetheless bound by customary international humanitarian law. According to Rule 97 of the ICRC's Customary International Humanitarian Law Study, there is nothing to suggest its non-applicability when a state's own nationals are being used as human shields. This law study is the interpretation of the Geneva Convention by the International Red Cross. Reading Rule 97, it is clear that the law regarding Human Shields applies across the board to both non-nationals and nationals. This is important because while it’s true that the Geneva Conventions only bind states, in practice, the interpretation of the Geneva Conventions by the ICRC "holds a certain persuasive weight". Although the authority of the ICRC could be seen as an extension of the same mandate the ICRC has from the signatories to the Convention, the ICRC’s interpretation of the Geneva Conventions is not binding per se. The interpretation of International Humanitarian Law principles in practice is a contested terrain. No one is going to argue against the ICRC and claim that an army is allowed to simply treat all civilians as combatants and attack them. However, there are variables such as the degree of participation in hostilities and the ability to distinguish civilians from combatants. Keep in mind that in a previous post, What does the ICRC say about civilians rioting in support of a military objective? we saw that experts differed on the paradigm to be applied in the case of Human Shields -- the conduct of hostilities, law enforcement or a combination of the two. Maybe the lack of absolute clarity in the area of Human Shields explains why Shurat HaDin is pursuing the lawsuit in terms of the recruitment of children, an issue more likely to generate a consensus from the ICC. Shurat HaDin, in fact, has been working to shed light on the intersection of International Law and War. It has been holding conferences - "Towards a New Law of War." How to stop the use of human shields? “Most people agree that the way to deter kidnappers is not to pay ransom, or grant them the concessions they demand,” he said. “The only reason kidnapping continue” is that “ransoms are paid and concessions are met,” he said. He goes on to examine how the Rome Statute might allow for more leeway. Yet, three years later, we seem no closer to a military-legal solution of how to deal with Human Shields in a way that will dissuade their use. 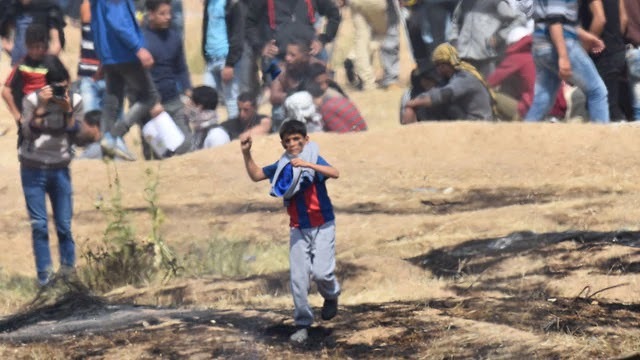 On the other hand, Hamas has refined their use, incorporating civilians into riots on Israel's borders to provide cover for terrorism -- riots that the media is all too willing to present as peaceful protests. But don't give Hamas all of the credit. 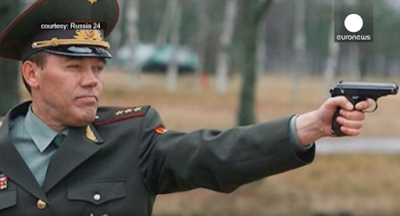 He goes on to describe to what has become known in the military world as the "Gerasimov doctrine." The Russians used this new strategy in Georgia, Crimea and Ukraine, where military force was used in combination with civilian activity. For example, in Georgia the pro-Russia citizens of Georgia seized tunnels and bridges on the expressway leading to the capital, Tbilisi. This enabled armed forces to enter the north of the country. The focus of applied methods of conflict has altered in the direction of the broad use of political, economic, informational, humanitarian, and other nonmilitary measures—applied in coordination with the protest potential of the population [emphasis added]. Colonel Kemp's suggestion, seemingly extreme when he first offered it, may no longer be enough just 3 years later.